Old, two wheeled beasts, Lucas electrical nightmares, Whitworth conversions, wiring diagrams in Italian, spanners, spraques, 110 octane petrol, long lost 5.5 mil. allen wrenches, too much coffee that's too black and too strong, asphalt and oil, gas and chrome, skinned knuckles and grease... If these are the things of your deepest, darkest, obsessions, then there is but one thing to do... Put your big boots on, find your helmet, kick that old lump over and RIDE that ancient two-wheeled spitfire demon from across the water and catch up with the ROADRUNNERS! 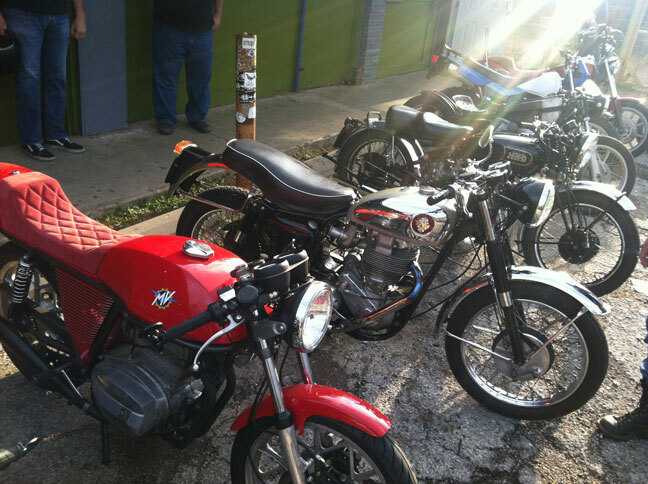 The Roadrunners British and European Motorcycle Association of Austin, Texas began on the 1st Sunday of June. 1994. Membership has always been free, there are no dues or fees, well, honestly...there is no formal membership...or formal meetings for that matter....all you have to do is ride to one of our events on an antique or vintage British, Italian, German, or Pacific Rim motorcycle... The older the better! (We look forward to seeing Specials, Sidecars and even old Hot Rods, so bring`em out). Monthly meeting is every last Sunday from 2-5PM @ The Lost Well. The Lost Well is located at 2421 Webberville Rd, Austin, TX 78702 ( just a touch North of East 7th St.)...these great new digs are owned by fellow vintage motorcyclist and is a perfect place to enjoy a cool beverage. We are also having our 20th Anniversary Show on Sept 21, 2014! Venue is "The Good Luck Grill" in Manor, TX (just East of Austin). And as always...no entry or registration fees! Any money raised will be donated to The Harvest Classic to give to the Candlelighters Foundation. We also have a facebook site so check it out too and see yall on the roads! BTW...This page is like many a project, so keep checking back for updates!